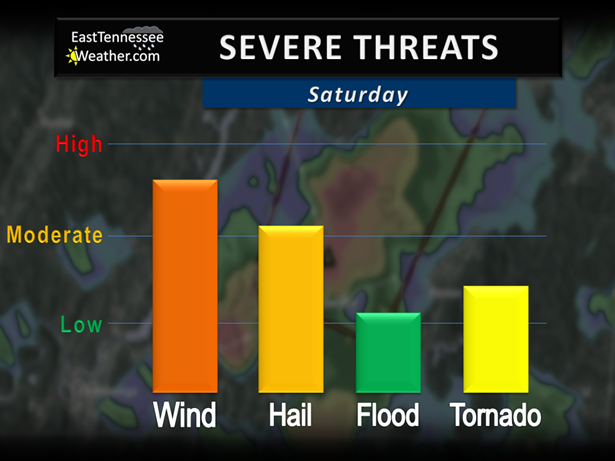 We are monitoring a threat for severe weather on Saturday. Strong to severe thunderstorms are possible across the region late Saturday afternoon and through the evening hours. 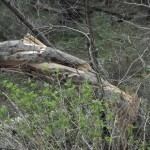 Damaging winds is the main threat, but large hail and isolated tornadoes are also possible. We may see a few storms during the afternoon and early evening hours. These storms may be severe, but the more threatening storms will likely occur later in the day and overnight. All locations in East Tennessee will be at risk for severe weather. But at this time, it appears those living further west and to the south will see the greatest risk. The Storm Prediction Center has issued a Slight Risk for severe storms for most locations west of Knoxville. All modes of severe weather are possible. The biggest threat is damaging winds, but large hail and heavy rain are also possible. Isolated tornadoes are possible, but we are not expecting an “outbreak”. Considering this threat is still a couple of days away, it is difficult to make a concrete forecast. We are also concerned about how colder temperatures this weekend will affect our chances of severe weather. However, prediction models are in a general agreement that there will be chance for severe weather Saturday through early Sunday. We will continue to monitor this developing situation and will keep you posted. Have our forecasts sent right to your email!